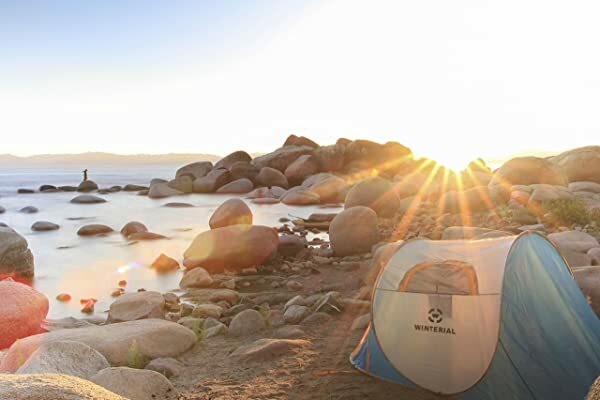 Pop up tents are not the most commonly bought tents for camping, but they are extremely functional and they will also save you a ton of time when looking at the setup. Pop up tent will be great for the children and they might even be great additions on your backpacking trips. These tents are generally quite cheap and you should pick them up for a decent price. We have decided to look a little deeper and find the best pop up tent that will make life easier for you. In this article, you will be learning which of these tents we consider great investments and we have also included a decent buying guide that will allow you to find the top pop up tent on the market. First, we’d like to show you a few of the benefits that you will have when using one of these tents. These tents can certainly make life much easier for you when compared to the standard setup of the normal tent. 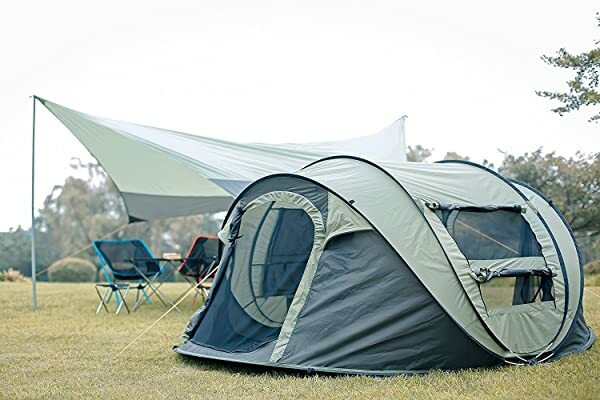 The main selling point of these tents is the fact that they are really easy to set up and you will basically have a tent ready in a matter of seconds. These tents feature a spring-like mechanism that will ensure the tent simply jumps into place once you have released it from the bag or from the strap that’s holding everything together. In terms of pricing, these tents are also sometimes much cheaper than their larger counterparts ​and they will have decent durability to go with this functionality as well. These tents are also sometimes smaller when it comes to overall design and since they can easily be compressed, often times, the people who are enthusiastic about backpacking will revert to using them for their trips. As with all outdoor products, you will find some that are really good and other that just pretend to be great, but with this guide, you should be able to discern much more easily between the bad ones and the good ones. Durability definitely comes in at the top of our list and having good durability in any tent is fundamentally important. Since tents are generally expensive, you will want to have a tent that can withstand the onslaught of nature and ensure that you are adequately protected from the elements. 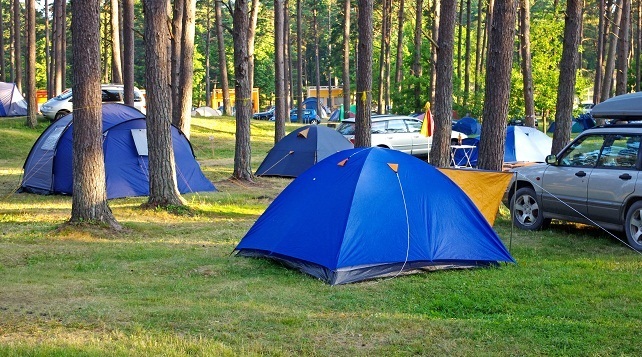 Pop up tents are generally available in either 2-man or 4-man sizes and this will depend on how many people will be going along on your trip. The larger the tent, the heavier it will also be to carry around. So, if you are a backpacker, you should consider looking for a pop-up tent that will be the right size for you and your partner. The tie downs and stakes will be important as well, but they will depend on the area that you will camp at. If you have to go camping somewhere near sand or snow, you will generally need to look for more of these stakes and tie downs to ensure that your tent does not get swept away by the wind. 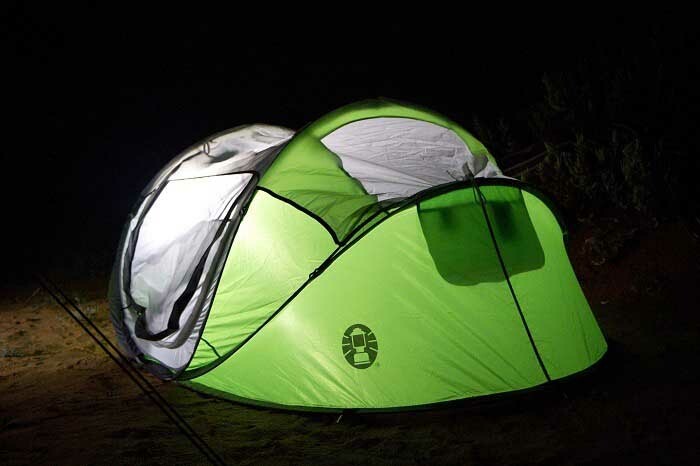 The pop-up tent should be protecting you during the day and at night. The materials used in the construction will play a huge part when it comes to determining the amount of protection. You should ensure that the tent can withstand UV rays and also the cold from snow, but of you choose to go cheaper, you could always add a tarp over it for even more protection. Packaging will be important if you are a backpacker, but as a minimalist camper, you will also want to pack as light as possible. In this situation, you will be looking at the overall weight and the dimensions of the packaging to ensure that you can get best out of you pop up tent when it comes to saving space and reducing weight. These 5 features are what we used as our criterion in judging all of the pop-up tents and separating the best from the rest of the pack. You can also use these features to help guide you in making the right choice and ensuring that you hopefully do get the best possible value for your money. Coleman is highly regarded as one of the top outdoor brands and they have a wide variety of products that will allow you to get the best possible value for your money. 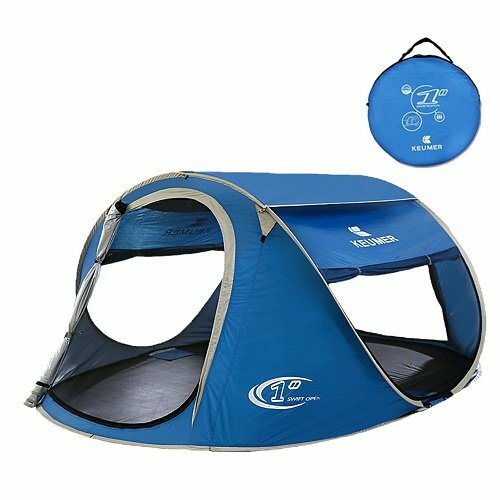 The Coleman Pop-Up tent is one of the smallest and most durable pop up tents that you could find on the market today. The materials are extremely durable and while this tent might not be fully leak proof, you will only have to fear a few minor drops when it is raining. The tent sets up in about 60 seconds and sometimes less and one of the great things is that it can be folded up and compressed in about the same amount of time. The one negative thing we did find was the fact that the tent will lose some of its speed after being set up and taken down for multiple times. This tent is also small and will be ideal for that backpacking in the backcountry. In terms of pricing, the tent is actually really affordable and we would highly recommend it to anyone looking to get something small and efficient to carry around with them on their camping or backpacking trips. We would also recommend that you do invest in some sort of a tarp to help give you even better protection from the elements. The FiveJoy Instant 4-Person Pop Up Dome Tent is one of the larger tent designs that you will be able to buy if you are looking for a very fast set up. 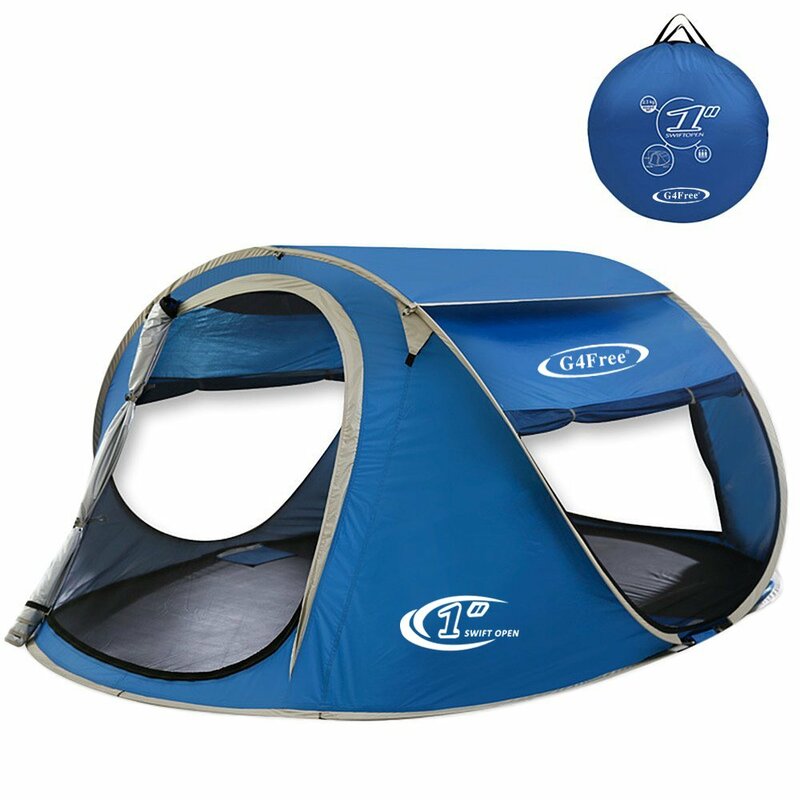 The tent is extremely durable and the seams have been reinforced. This tent also has been PU coated and this will ensure that you are protected from any UV rays that might potentially damage the tent. This tent sets up in a matter of seconds and will definitely amaze some of the people who are watching. 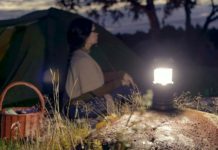 It is great for multifunctional use and at night you will have additional loops where you can hang some of your lanterns as well as the other lighting features. We were intrigued by the size and the fact that something designed for 4 people can be set up in a matter of seconds. In terms of pricing, this tent is a little more expensive, but we still highly recommend it for the value and the durability. If you are looking to save time and space, this will be the right tent for you to buy. The Pop Up Tent Beach Cabana is more of a cabana than it actually is a tent. This cabana is great for those who would like to have that additional sleeping area on a camping trip that will give them some great ventilation. This cabana sets up really fast and with the addition of the fiberglass poles, you should have no issue with stability. This cabana/tent also is ideal for the summer months and while it might not really hold up that well in the snow, it is fully waterproof and will ensure that you get some decent ventilation as well. 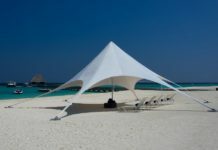 It is also really affordable and we would highly recommend this cabana/tent for the multifunctional use and especially for those who like the beach. Whilst featuring a dome design, this tent is one of the largest pop-up tents that you will find on our list. The tent easily pops up in 3 seconds and it is really great against the elements with the outer layer of material coated to provide you with some great resistance against UV rays and even the wind. The tent also gives you some added protection with the addition of the rain fly and this will ensure that you have some multifunctional use. The rain fly can be detached and will be great for if you want something for the beach. 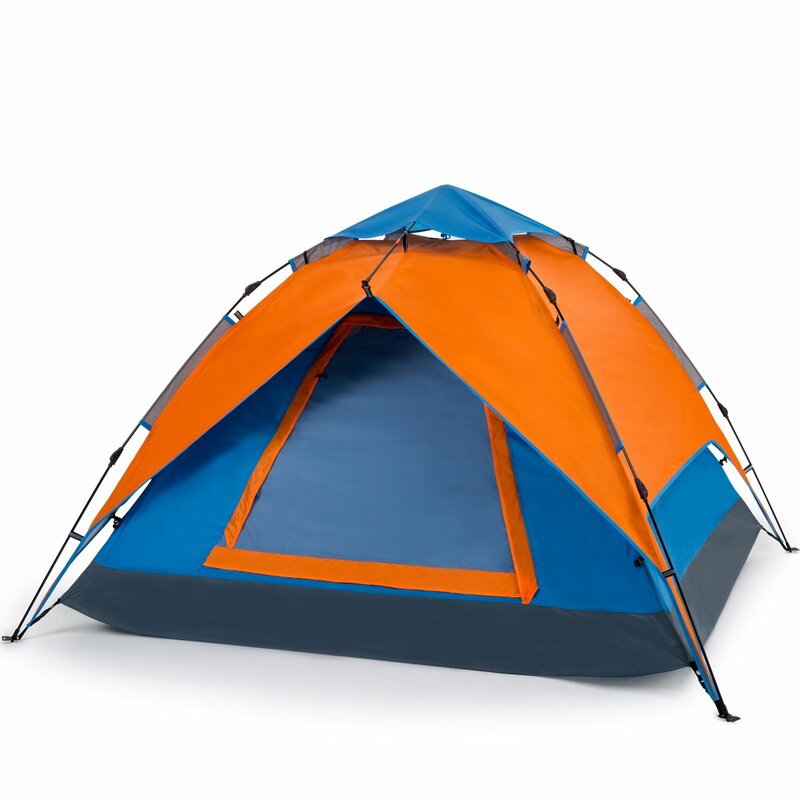 This tent is also really affordable and lightweight. Not only will it be great for those looking for something to backpacking with, but it will also be ideal for camping, hunting and fishing. 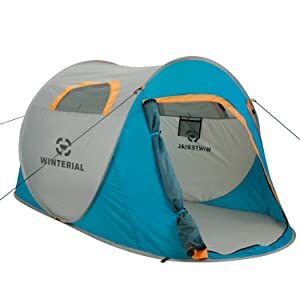 We have the Winterial 2 Person Instant POP UP Tent and this tent features an extremely unique design. The tent itself is quite large and will be cozy for 4 adults. It is also extremely durable and will ensure that you can resist all of the elements and keep you protected in the weather. This tent also included great ventilation will be ideal for 2 sleeping pads with more than enough extra room for luggage. In terms of pricing, the tent is actually really affordable and you will certainly get great value for your money. 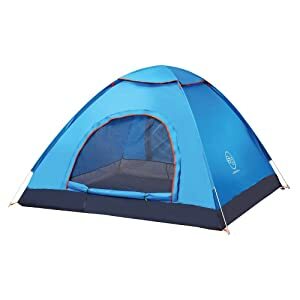 We would recommend this tent for those going backpacking due to the lightweight size, but it will also be great for those looking for some added space when camping. Last but certainly not least, the Survival Hax 2 Person Instant Pop Up Tent is another really affordable and greatly designed tent for those looking to save some space. It has been constructed with 190D Oxford materials and will ensure that the elements cannot easily get inside or even cause problems when you are camping or backpacking. This tent also sets up in a matter of seconds and you will be amazed at how easily this process is. Just throw it in the air and it will open up automatically. The tent itself is also not too expensive in our opinion and we would highly recommend it to anyone looking for a lightweight tent to go backpacking with looking to save a few dollars from the more established brands. 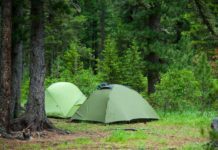 Pop up tents are not widely used, but we hope that this article has opened your eyes and showed you the differences between them and regular tents. 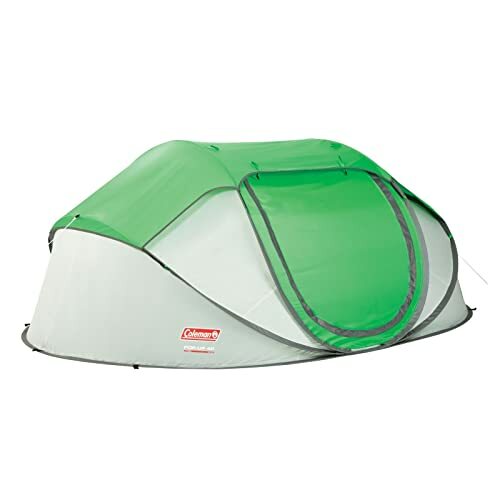 In terms of recommendations for the best pop up tent, we will pick the Coleman Pop Up Tent. 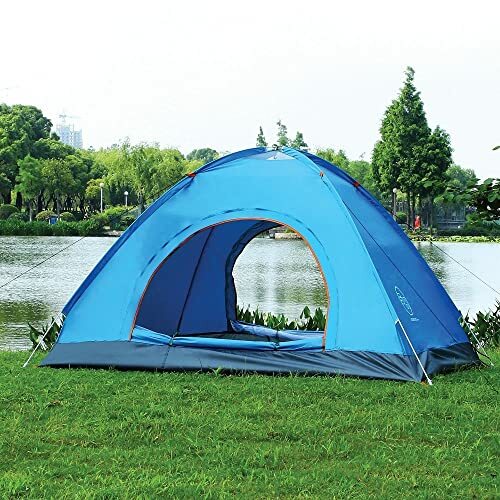 This tent is much more durable and will be ideal for both backpacking and camping. You will also be able to buy the larger 4 person tent if you really need the additional space. Now it is time for you to leave us a comment on what you think and to go out into the wilderness and find out how functional the pop-up tent actually is. 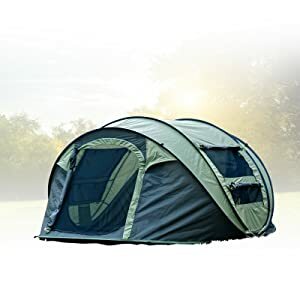 My wife and I really love camping, and I think that getting a nice pop up tent is something that she’d really like for us. I’m glad that you talked about wanting a durable tent so that your investment doesn’t get destroyed by nature. I want to make sure that our pop up tent is something that can keep us safe from the elements and stand up to the tasks we use it for! Thanks for the information! A roadeavour lantern would be perfect with those tents! Great list!